We can work with the city to secure permits and subsidies that help you reduce costs and insure a smooth installation. 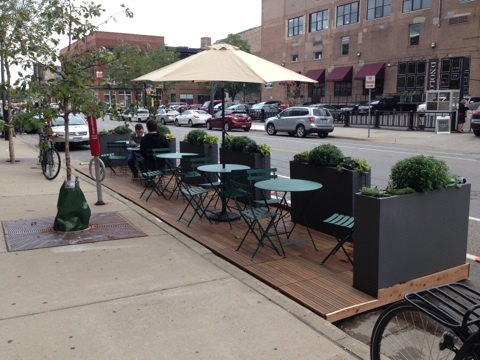 Our full year round service includes designing, installing, maintaining, and storing the parklet for the winter. Each system can be customized to your site size and conditions, and how you want your customers and community to use it. We work directly with the manufacturers to create your vision while considering budget. The included planters can hold a large variety of plant material types. Some include garden herbs, vegetables, blooming flowers all season, and even a couple trees in some designs. When winter comes we package them up and ship them to a storage location for the winter so they last for many years.